This is Thanksgiving week. I’m getting ready to bake bagels and start on a buttery pie crust. I’m double-checking my shopping list for how many total cups of cream I need before I rush out to gather the rest of the ingredients for the big day. Our menus for breakfast and the main meal are planned, and they’re full of rich and decadent things suited to a holiday that’s all about food. And, now I’m showing you a not-so-Thanksgiving-y light and lovely quinoa salad. Maybe think of this as the perfect day after Thanksgiving dish. The combination of Ruby Red grapefruit and avocado is what got my attention. The salad is found in The Kitchn Cookbook , and I received a review copy. It’s actually more than a cookbook. It begins with tips for setting up or reorganizing your kitchen. There are specific ideas for how to arrange cookware and utensils, but more importantly, it gets you thinking about how you use your kitchen and what will work best for you. There are also photos and ideas from several very different but all beautiful kitchens. Then, the book has you covered with tips for stocking your pantry and some basic cooking techniques. This leads up the recipes section with dishes for every meal of the day plus sweet treats and party planning ideas. The recipes come with lots of suggestions for variations to make them your own. The Sweet Potato and Caramelized Onion Hash with Baked Eggs would be great as a vegetarian brunch dish, or roasted chicken or cooked sausage could be added. Homemade Potato Chips are offered either baked or fried. The Roasted Shrimp with Horseradish Ketchup is now on my to-try list because I realized I’ve never made homemade ketchup. And, I’ve somehow never tried the extremely popular Magic One-Ingredient Ice Cream that appeared TheKitchn.com. It’s made from frozen, very ripe bananas, and I can’t wait to make it. But, I had just received some Ruby Red grapefruits from my CSA, and this quinoa salad came first. I used a three-color mix of quinoa because I love the different colors, and I’ve heard the red and black varieties have more nutrients than white quinoa. It should be rinsed before being cooked, and the cooking process is a quick hands-off 20 minutes of simmering. After cooking, the quinoa was left to cool. Meanwhile, I made the vinaigrette with lemon juice, minced shallot, and sherry vinegar. Grapefruit sections were supremed and then chopped into big chunks. Almonds were toasted and chopped, and cucumber and celery were diced. The cooled quinoa was combined with the cucumber, celery, grapefruit, and some lemon zest. The vinaigrette was incorporated, and then the almonds were folded into the salad. I had a pretty head of butter lettuce from my CSA, so I served the quinoa salad in some lettuce leaves. It was topped with sliced avocado and crunchy, flaked sea salt. There are a lot of great flavors and textures here, and the sweet, citrusy grapefruit with the tender avocado was as delicious as always. I particularly love the mix of grapefruit, avocado, and shellfish, so I served roasted shrimp with the salad. Crisp celery and cucumber and crunchy nuts added nice variety. If you only add the avocado as a topping to each serving, the salad can be stored in the refrigerator for a few days. I think it would also be perfect with some sliced, leftover turkey. Happy Thanksgiving! Recipe reprinted with publisher’s permission from The Kitchn Cookbook . Once we nailed down how to cook quinoa perfectly every time (our post on making quinoa still brings thousands of readers to our site every day), a whole new world of seed salads opened up. Tossed with grapefruit segments, cucumber, and toasted almonds, and topped with creamy avocado, this quinoa salad makes a great lunch dish, or a side for dinner. Rinse the quinoa for 2 to 3 minutes in a fine-mesh strainer, rubbing vigorously. Drain. Heat a 2-quart saucepan over medium-high heat and add a teaspoon of oil. When the oil is hot, add the quinoa and cook, stirring to coat the quinoa with olive oil, for 1 minute. (The quinoa may pop, so be prepared to stir right away.) Pour in the broth, bring to a boil, cover, and turn the heat down to low. Cook for 15 minutes or until most of the liquid is absorbed. Turn off the heat and let the quinoa sit, with a folded dishtowel over the pot lid, for 5 minutes. Line a large baking sheet with parchment and spread out the cooked quinoa in an even layer. Let it cool while you prepare the remaining ingredients. Whisk together the lemon juice, shallot, and sherry vinegar. Slowly stream in the remaining oil while whisking, until the vinaigrette is emulsified. Set aside. To prep the grapefruit, peel away the top and bottom of the grapefruit rind until you can see the flesh. With a sharp knife, peel away all rind and pith along the curve of the grapefruit. Then cut between the white segments and cut out the flesh. Roughly chop the grapefruit segments and set aside. 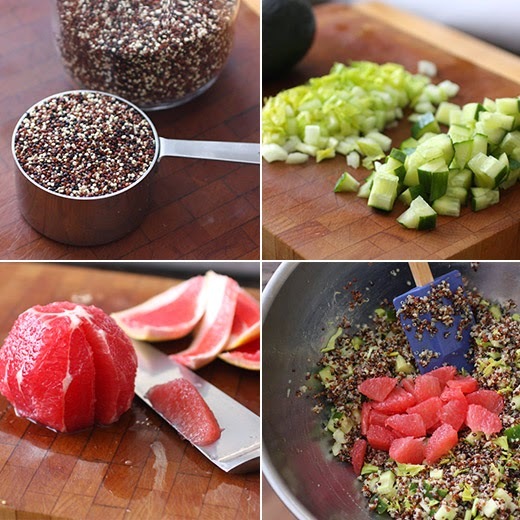 Transfer the quinoa to a large bowl and add the cucumber, celery, grapefruit, and lemon zest. Add the vinaigrette and toss gently. Fold in the almonds. Taste and adjust the salad to taste with salt and pepper. At serving time, top the salad with the avocado, a sprinkle of flaked sea salt, and freshly cracked black pepper. This dish will keep in the refrigerator for 1 day in a sealed container. Lisa, I love this salad (and I always make roasted shrimp w/ Heinz ketchup and Gold's horseradish in the summer! and add an avocado!). Have a happy Thanksgiving.....I have some ripe avocados, so this is lunch tomorrow. A fabulous salad! Fresh, colorful, healthy and delicious. You can't ask for more! 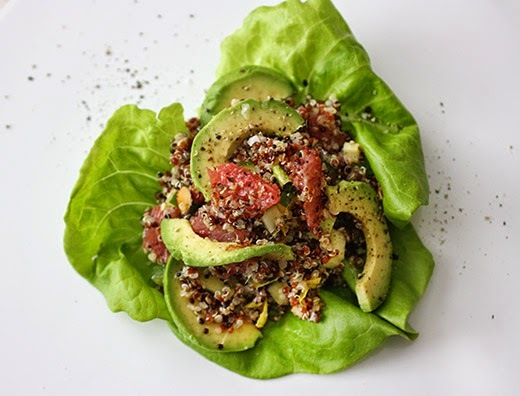 I love quinoa and quinoa salads and love the combination of flavors here...I've made one similar before and now you have me craving it again. This is a perfect lunch, especially before the upcoming holiday eat-a-thons. Your quinoa salad looks simply delightful! Terrific use of quinoa! I think it's perfect in salads (and soups) -- less interesting served on its own. This looks delish -- thanks so much. Dear Lisa, That looks light and very healthy to enjoy; especially before the holiday meal that is coming. This salad looks so fresh and light, Lisa! I love avocado and quinoa in just about anything. What a great post, we are all going to be craving salads by the weekend! Happy Thanksgiving Lisa! Happy Thanksgiving dear foodie friend! I bet you're cooking up a storm right now. Not me, not this year. Lovely refreshing salad. And those colors are making it so tempting. 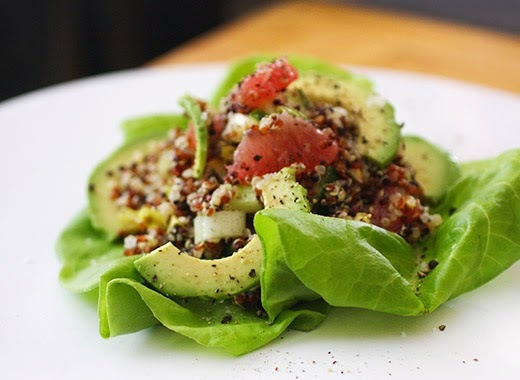 Definitely need to make this delicious quinoa salad.. it looks incredible! Hope you had a great Thanksgiving celebration, Lisa! Saving and pinning this beautiful salad. Avocado, almonds, and quinoa . . . how healthy at such an indulgent time of year! Perfect Lisa! my tastes are relatively simple, and there are a few things i really really like. avocado is one, almonds are another. you've definitely got a hit with me here! I need a big bowl of this healthy, delicious salad in my fridge! I did a lot of caramel sampling yesterday and need to get back on track. It looks amazing!